Muslims' sense of belonging could be eroded by European nations not tackling discrimination, a watchdog has warned. The report calls on governments to speed up Muslim integration - but says Muslims must also do more to counter stereotypes and fears of extremism. 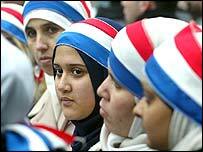 At least 13 million Muslims are thought to live in European states. In the report, the European Monitoring Centre on Racism and Xenophobia (EUMC) says it has documented a wide range of anti-Muslim or Islamophobic abuse across the EU's 25 member states. The body was established by Brussels in 1998 to collect accurate data on extremism across the continent. It says that Muslims are confronting a rise in racism ranging from violence through to discrimination in housing and employment. The EUMC's report lists hundreds of reported cases of violence or threats against Muslims from across the continent. These incidents include attacks on mosques, verbal abuse of women wearing veils or headscarves and other forms of discrimination. However it says it is difficult to fully understand what may be happening because so few countries collect data on religiously-motivated hate crimes. The report says the UK is the only member state currently publishing crime statistics on hate crimes against Muslims. Beate Winkler, director of the body, said the 117-page report underlined the vulnerability of Muslims to discrimination across the EU amid an intensifying debate over Islam's place in the West. "The report makes it clear that Muslims, along with other migrant and minority groups, frequently suffer different forms of discrimination which reduce their employment opportunities and affect their educational achievement," she said. "This can give rise to hopelessness and could undermine Muslims' sense of belonging in the EU. "Integration is a two-way process. Many European Muslims acknowledge that they need to do more to engage with wider society. "At the same time, Europe's political leaders must make a stronger effort to promote meaningful intercultural dialogue and tackle racism, discrimination and marginalisation more effectively." The position of Muslims in the EU has become an increasingly important political question in the five years since the 9/11 attacks on America. However, events ranging from terrorism to the international row over the Danish cartoons of the prophet Muhammad - has made integration a problematic issue for many governments. 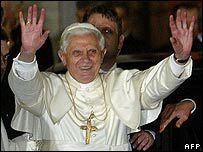 In Turkey earlier this month, Pope Benedict XVI appealed for greater understanding between Christianity and Islam. He also sought to ease Muslim outrage over his remarks in September that cited a medieval emperor speaking about violence and Muhammad's teachings. "Muslims feel that acceptance by society is increasingly premised on 'assimilation' and the assumption that they should lose their Muslim identity," says the report. "Muslims feel that since 9/11 they have been put under a general suspicion of terrorism." The report recommends that EU nations do more to boost the job opportunities of Muslims and to improve the way schools explain Islam to children. It praises some initiatives to improve inter-ethnic relations and integration, such as a programme of faith studies in Luxembourg schools and community forums in the Netherlands.